Our online Canadian pharmacy allows those living in the United States to purchase prescription drugs at a reduced cost. This page is intended as a guide and resource to purchasing Canadian prescription drugs, but is by no means definitive, exhaustive, nor does it intend to replace consulting your American doctor or practitioner. 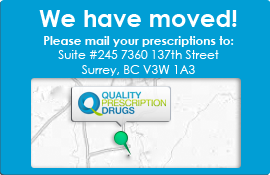 Navigate the links below to find out more about our Canadian prescription service. If you have any further questions, please let us know by filling out our customer feedback page and we will address them within 24 business hours. What is a Canadian online pharmacy? Which prescription drugs can a Canadian pharmacy ship? How many Canadian prescriptions can I order at one time? Are Canadian prescriptions the same as American prescription drugs? Do Canadian prescriptions have different names or look different? You can find the link to the "National Drug Code Database" from that page. Notice: Medications shipped from Canada have been approved for use in Canada by Health Canada, a prescription and non-prescription drug regulatory body similar in function to the United States Food and Drug Administration (US FDA). Since the FDA has no jurisdiction in Canada, the drugs which you received from our service have not been approved by the FDA. They have been approved for use, however, by Health Canada for use by the general Canadian population.